For the first time since it was built in 1985, this three-possibly-four bedroom, two and a half bath ranch house is on the market. If you are interested in living on one floor, this is the home for you! The large master bedroom (22′ x 14 1/2′ feet) has a huge arched window that faces the southern exposure, and another window that faces the east and sunrise. The master bathroom has a shower, skylight and new vanity. The master closet is a walk in with plenty of room for the belongings of two! On the other end of the home are two more bedrooms and an office/den which could have future use as a fourth bedroom. One of those bedrooms also has a private half-bath, and there is a full bath in the hall. 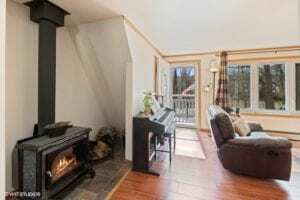 The living room, dining area and kitchen are an open floor plan, with a Hearthstone wood-burning stove in a central area to keep the home toasty in the cold months. 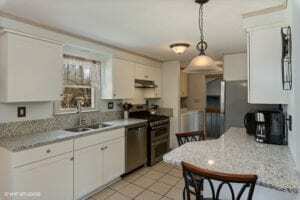 The kitchen was recently upgraded with granite counters and new white cabinetry. There is a pantry and storage closet as part of the kitchen as well. With over an acre of wooded and grassy land and with a backyard deck, there is plenty of room for barbecuing, enjoying a fire pit, storing firewood, playing basketball or tag, and more. Parking for two cars exists in the garage, but there is also space for six or more vehicles in the driveway. This amazing home has been readied just for you! If you are interested in a ranch style home that is close to everything Monroe NY has to offer, then this may be the one you’ve been waiting for! For more details, click on any of the photos above for listing information, or call me (Kat) at 914-419-0270. You may also send an email to kat@thehousekat.com.